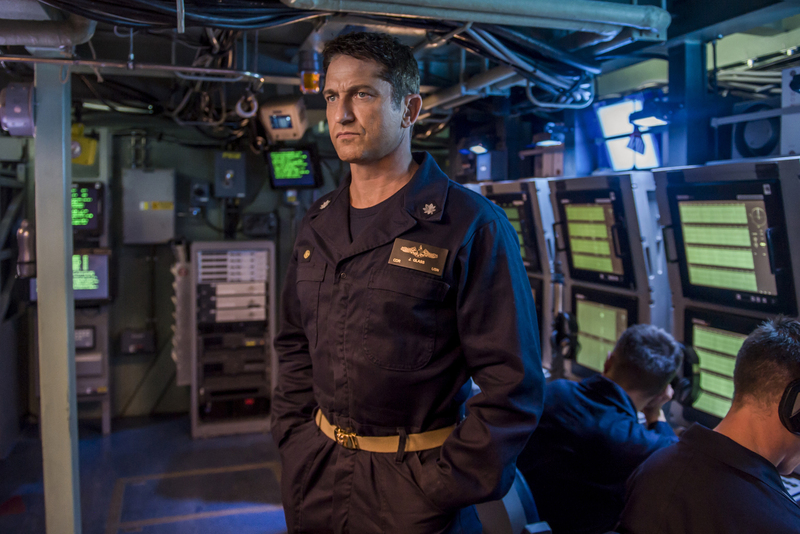 Newly promoted Commander Joe Glass (Gerard Butler) is promptly called in to helm a USS Arkansas submarine, to investigate the disappearance of the USS Tampa Bay, last seen in the Arctic while tracking a Russian sub. Meanwhile, at a Russian Naval base, a Naval SEAL team, led by Lieutenant Bill Beaman (Toby Stephens), witness defense minister Dmitri Durov (Michael Gor) stage a coup, taking Russian President Nikolai Zakarin (Alexander Diachenko) prisoner. Back on the USS Arkansas, Commander Glass soon discovers the destroyed USS Tampa Bay, along with a Russian sub that appears to have sunk under unusual circumstances. 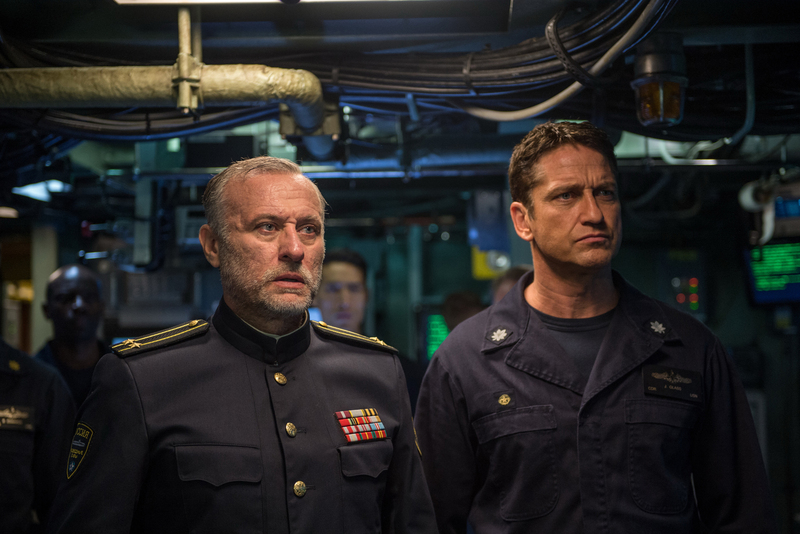 After winning a surprise skirmish against another Russian submarine, Glass takes the surviving crew on board, to come face-to-face with Captain Sergei Andropov (Michael Nyqvist). As news of Durov’s takeover and subsequent plan to start a war is relayed from the SEALS to the U.S. Base, headed by Admiral Charles Donnegan (Gary Oldman), and to Glass, a reluctant alliance is formed between the Americans and the Russians, as a plan is hatched between the above-water SEAL team and the underwater submarine to stop Durov’s proposed fight. Hunter Killer is a strange beast indeed. On the one hand, viewers get enough of what they came for — deep-sea action and on-ground shoot-outs, yet it all seems rather lacking. This might have something to do with its ho-hum direct-to-video vibe, the reason for this pretty apparent from the get-go — dull characters and pacing that’s, dare I say, too fast for its own good. The latter may be an odd one to point out as I usually prefer action films to get on with things efficiently — see John Wick: Chapter 2 (2017) for one such stellar example. The thing is, by their very nature, submarines don’t quite scream Fast & Furious-style breakneck speed, unless we’re talking about the crazy climax of The Fate of the Furious (2017). Generally, the best submarine flicks lean into the suspense and mystery of the deep black waters, usually with strategy and politics at the forefront — think Das Boot (1981), The Hunt for Red October (1990), and the overlooked U-571 (2000). One of the reasons for this is that, despite their incredible design, submarines are arguably delicate, in the sense that ordering a strike and then missing could very well reveal one’s precise location with return fire ending it all — if not with an immediate hit, then in the inevitable flooding. For the commanders involved, this means careful strategy is paramount. The filmmakers of Hunter Killer don’t seem to ever acknowledge and exploit this very scary reality. It genuinely feels as though any threats can be dealt with, and as for mystery — what mystery? Essentially, the opening sequence is about as intriguing as things get, but don’t worry, by the 30 or so minute mark, everything has been laid out, which means the remainder of the movie’s run-time is spent watching characters join the dots and execute the plan. Commander Glass is set up to be ‘unorthodox,’ but he may as well be Superman with his uncanny abilities. Gerard Butler has certainly established himself well at helming a particular brand of undemanding b-grade action, with Geostorm (2017) being a particularly awful entry and Den of Thieves (2018) a remarkably crackling one. Here, his performance is about as much as you’ve come to expect — he’s firm and doesn’t break a sweat, which once again demonstrates that real suspense isn’t at the forefront of this film’s goals. It’s not entirely Butler’s fault — while he did dip his hand into the producing side here, I blame the bargain-basement direction of Donovan Marsh, Avenged (2013), whose unremarkable filmography shows that he somehow struck the opportunity of a lifetime. I’m wondering if a deal was negotiated between Butler and Marsh during a drunken encounter at a film premiere. On the support side of the cast, Michael Nyqvist, John Wick (2014), in one of his last roles before his passing, has a decent presence, feeling at least credible as a proud Russian Captain. Elsewhere, Linda Cardellini, Daddy’s Home (2015), and Common, Suicide Squad (2016), have very little to do as National Security senior analyst Jayne Norquist and Rear Admiral John Fisk, respectively. Toby Stephens, 13 Hours (2016), is easily the worst of the ensemble as the overly shouty Lieutenant Bill Beaman, who really needs a chill pill or a bullet to the head. The inclusion of recent Oscar-winner Gary Oldman, Darkest Hour (2017), almost feels exploitative — likely an easy cash-grab traded for star power, as this certainly doesn’t have much in the way of prestige behind it. Moviemakers must’ve picked up Oldman hot off his other foray into mid-budget action with last year’s hit The Hitman’s Bodyguard (2017); his screen time doesn’t feel particularly significant and his contribution, while as professional as ever, looks like someone waiting on their payday. The ‘based on the book’ tag does very little to convince that there was a good grounding to begin with, 2012’s Firing Point by George Wallace and Don Keith sounding little more than Tom Clancy-lite. Screenwriter Jamie Moss, Ghost in the Shell (2017), seems to have always needed a co-writer to polish his work, this time flanked by the film’s executive producer Arne Schmidt, Chain Reaction (1996), which may not have been the greatest idea, considering that, despite a lot of producing experience, this is Schmidt’s first screenwriting credit. I will say that the producers, headlined by the ever-busy Neal H. Moritz, Goosebumps 2: Haunted Halloween (2018), were smart enough only to go mid-budget on this one, reaching a price tag of around $US40 million, which they’re likely to get back by the time this gets onto the home streaming services. I mean, there are times when it still all looks rather cheap — namely some of the CG action, but at least someone had the foresight to realize that this production didn’t need more cash, lest it sink any opportunity to break even. 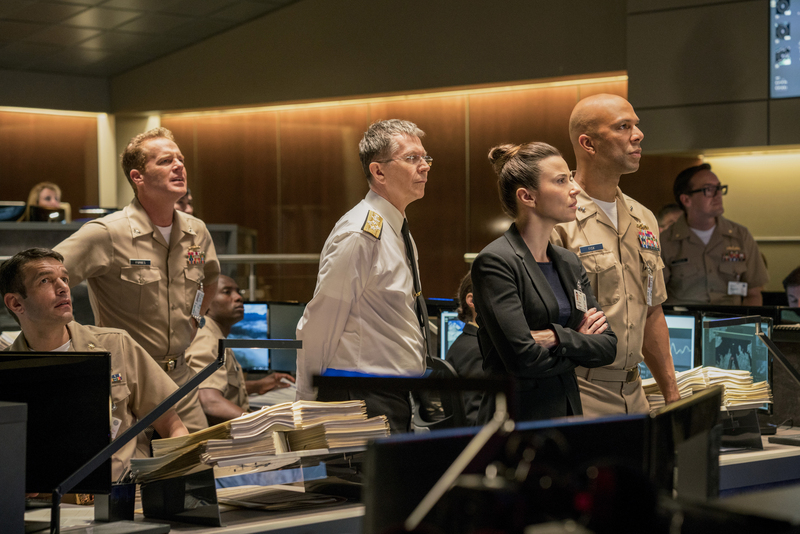 Hunter Killer isn’t likely to top anyone’s best action movie lists of 2018 — just how does one compete with the gold standard of Mission: Impossible – Fallout (2018) anyway? It’s definitely the sort of movie that works best on a Saturday night with a few alcoholic drinks to soothe any expectations, but really, you could do better.